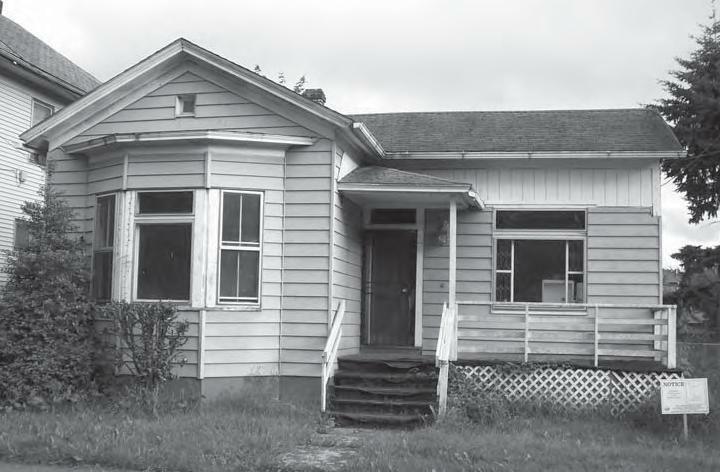 The Eliot neighborhood may soon be losing a historic home at 216 NE Tillamook. A demolition permit was filed by the company who purchased it two years ago but the city required a 120-day demolition delay on the house due to the fact that it is inside a historic zone and the age of the house. The delay is designed to provide some opportunity for someone to move the house to another location and restore it. Fortunately for the house, the owning firm who planned a condominium development on the site had financial problems and the property entered foreclosure recently. On the outside, the house does not look like much due to neglected maintenance for years and aluminum siding applied about 30 years ago. It is likely that the original siding remains underneath in good shape. The house has charm with a simple bay window in front. Two colorful stained-glass windows of note were stolen last year from the transom over the front door and the upper window sash in the front living room. These windows may have been added to the house in the early 1890s and made by the Povey Brothers Art Glass Company here in Portland. Most of the Victorian-era millwork remains intact inside around doors and windows. The picture moulding railing below the ceiling in the front rooms has decorative patterns embossed into the wood. This is what people used to hang pictures from avoiding nails in the plaster. In 1883, Andrew J. Rockafellow, an early Albina area building contractor, built this home for his family. He was born in Illinois in 1833 and worked his way to Albina around 1880. This was one of the first houses built on this block and the oldest dwelling surviving today. Sometime around 1890, Mr. Rockafellow added on to the rear of the house. A round bay window was also added to the back of the house for a good panoramic view of the large backyard. In 1906, he was a widower, and moved into the home of his son-in-law in Rainier, Oregon and sold this house to Mrs. T. Smith St Claire. She was one of the earliest African-American businesswomen in the Portland area representing a significant minority at that time. Since the 1890s, she managed the Arcadia Saloon and Club at NW 2nd & Everett. It is likely she lived in this home but was not listed in directories, as women and minorities were usually not posted. During the 1910s & ‘20s, the house was the residence of Edward & Ida Freeman, also early African-American arrivals to the neighborhood. They opened and operated Freeman’s Second Hand Goods. This early thrift store was successful and remained on Martin Luther King Jr. Blvd. for many years. They were grandparents to Judge Clifford Freeman, who passed away recently. This is another excerpt of the book “The History of Albina”, published by the author. The book is 248 pages with 500 photos and illustrations. It can be purchased at Broadway Books at 1714 NE Broadway and Powell’s Books downtown plus Reflections Books and Coffeehouse at 446 NE Killingsworth. An autographed book can be purchased from the author postage paid. Early purchases are highly recommended as it will be a limited printing. The author can be emailed at reroos@juno.com or contacted at 503-282-9436. Some information from Bosco-Milligan Foundation studies on African-American history.